Sony BDP-S770 review | What Hi-Fi? 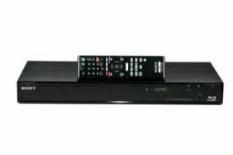 Another month, yet another fine Sony Blu-ray player: it almost seems unfair on the competition, so near-complete is the Japanese giant's stranglehold on the Blu-ray market in 2010. Granted, the 3D-capable BDP-S770's appeal is more select than some of its cheaper siblings. It's essentially a mildly tweaked BDP-S570 : you get a revised fascia based on Sony's ‘Monolithic' design plus a remote control with a few backlit key functions, but little else of apparent note. There are no multichannel analogue outputs or twin HDMI sockets, for example, both of which would have served the Sony well in comparisons with the Panasonic DMP-BDT300 (theoretically more expensive, but actually available for not a great deal more money). So, is that enough to justify the 'S770's lofty price? Much to our surprise, the answer's yes – just. We've been assured by our contacts at Sony that the ‘S570 and ‘S770 are technically very similar, yet when the two are compared head-to-head for picture and sound quality, it's the ‘S770 that comes out on top . Granted, we're not talking about massive steps up in performance – owners of the 'S570 needn't be concerned – but all the same, the 'S770's sound is a little gutsier, while its colour palette seems a little more vibrant and its edge definition (both in 2D and 3D) subtly crisper. However, other key specifics of picture performance – contrast, overall black levels and motion stability – are nigh-on indistinguishable between the two players, so possibly, any differences that exist between them are more to do with subtle differences in production tolerances than anything more specific. Still, the rest of the BDP-S770 ownership experience is equally compelling. Its start-up times are supremely fast, its on-screen menus are a model of clarity and efficiency, and it includes a comprehensive array of online video streaming services, including the BBC iPlayer, Demand Five, LoveFilm streaming and Sony's own online service. All this is is accessible via built-in wi-fi or over a wired connection as you prefer, and, thanks to its DLNA support, the Sony will also seek out any suitable digital media on your network to be streamed as you wish. With front and rear USB inputs, there's ample support for a broad range of connected media, and thanks to useful usability features such a neat iPhone remote app, it really is a delight to live with. But should you buy it? Essentially, it all depends on your budget. The BDP-S570 is this range's ‘sweet-spot' model, offering the strongest mix of features, performance and value, but if you can afford an extra £50, we'd give the BDP-S770 serious thought.